Daniel Fabricant, of the Smithsonian Astrophysical Observatory, an early leader in the GMT’s design, appears with a spectrograph under construction in Cambridge. 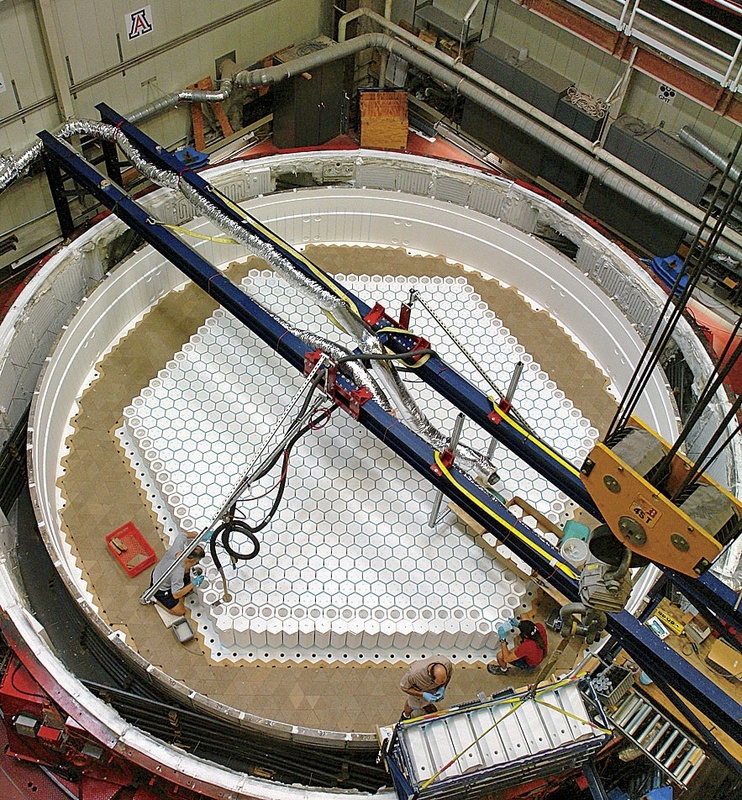 At the Steward Observatory Mirror Lab, in Tucson, staff load the rotary kiln with hexagonal columns of refractory material. At the Steward Observatory Mirror Lab, in Tucson, staff load the rotary kiln with 20 tons of chunks of borosilicate glass. The detail shows a chunk of raw glass. At the Steward Observatory Mirror Lab, in Tucson: with the raw glass in place, the rotary kiln can be covered and prepared for heating. 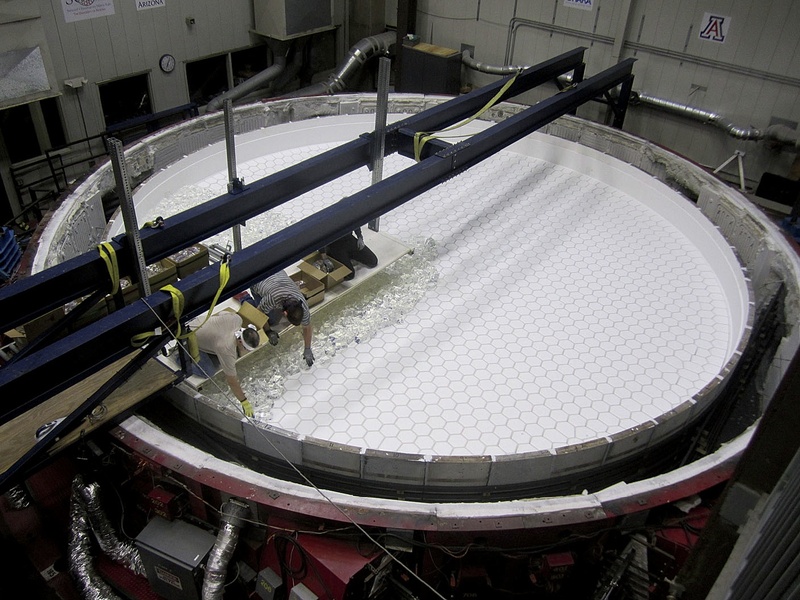 After the glass is in place, the oven lid is installed and the glass is heated to 2,120 degrees Fahrenheit while the assembly is rotated to form a curved upper surface for the mirror as the molten glass flows over and between the hexagons—yielding a lightweight, strong honeycomb structure. Load-spreading supports affixed to the lower surface will attach the finished mirror to its steel cell, and enable operators to maintain its shape and stiffness. 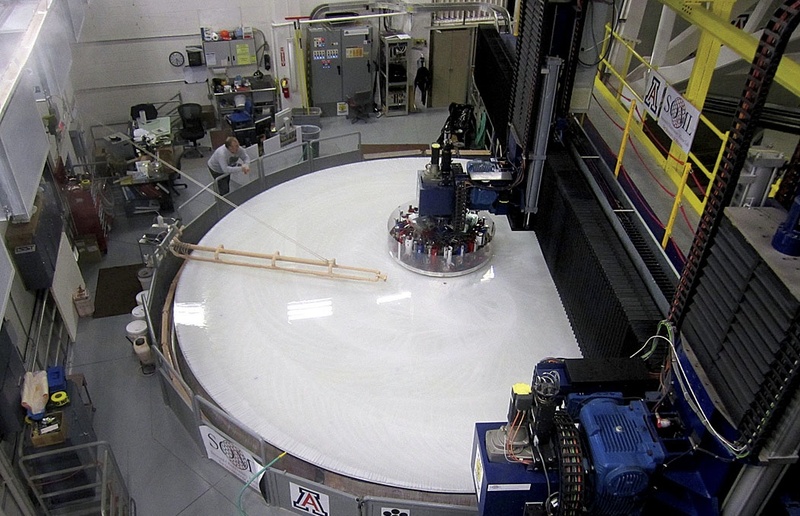 After the mirror glass is cooled and the structure is connected to its supports, the reflecting surface undergoes years of computer-controlled precision polishing and optical testing. Harvard astronomers seek answers to fundamental questions about the origins of the universe with the Giant Magellan Telescope. These scientists are giving voice to the curiosity that propels astronomy today. 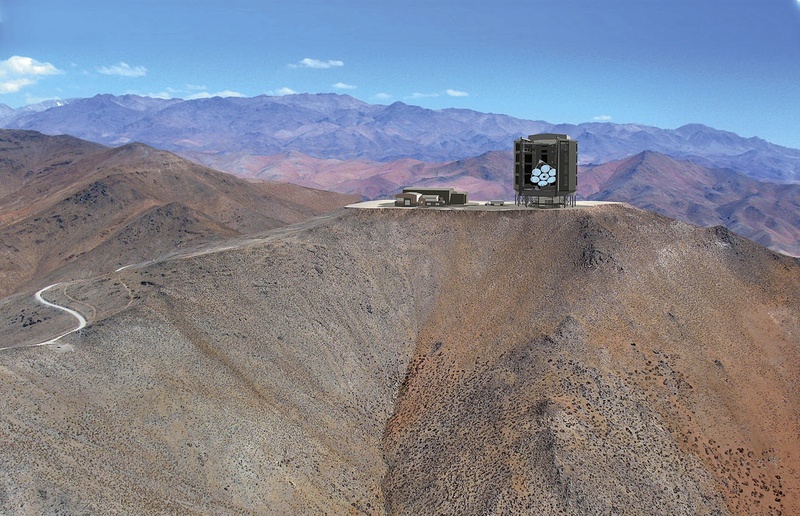 As they scan space, pursuing research on a vast scale—from the evolution of elements from the first simple building blocks (hydrogen, helium, and a trace of lithium) to the formation of stars, planets, and galaxies—they and hundreds of colleagues worldwide are also joined in a terrestrial enterprise: the Giant Magellan Telescope (GMT), an extraordinary instrument that will enable such discoveries. 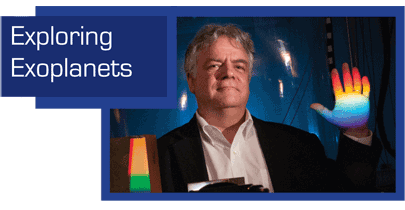 Patrick McCarthy, the astrophysicist who in 2008 became director of the nonprofit organization designing and building the GMT, says of the telescope and its associated analytical instruments, “This is where hardware meets science”—on an enormous scale. Astronomy is the ultimate observational science. Humans have probably always looked skyward, noting the passage and patterns of the sun, moon, and stars. The eye is the essential instrument, and the subject of study is readily available—overhead. Astronomers cannot manipulate a star in a laboratory, or examine a black hole under a ventilating hood. They observe from afar. For those observations, the eye, however elegantly evolved, is inadequate. As Harvard undergraduates learn in Astronomy 100, “Methods of Observational Astronomy,” the human pupil’s size (half a square centimeter) constrains light-gathering; exposures are limited (blinking); and the eye perceives only the colors of the visible spectrum (electromagnetic radiation with wavelengths from 400 to 700 nanometers). Those features confine observations to relatively bright objects; limit resolution—the measure of blurring or overlapping of images, and hence of the fine details that can be seen—to about one foot at a distance of a mile; and as a practical matter restrict observation to only as far as a few million light years (a long way at nearly six trillion miles per light year, but barely beyond the windowpane in a universe with stars billions of light years distant). Galileo’s revolutionary telescope of 1609 represented a more than twentyfold gain over the eye’s light-gathering area, quickly revealing features of the lunar landscape, multiple stars, and Jupiter’s own moons. As Geoff Andersen explains in The Telescope: Its History, Technology, and Future (2007), “[R]esolution can only be improved by using shorter wavelengths of light and bigger telescope primaries [mirrors].” Moreover, “[A] larger mirror will collect a greater amount of light, and thus give us brighter images of distant objects and allow us to take images in a shorter amount of time”—the prospectus for telescope-makers ever since Galileo’s epochal discoveries in Padua. The scaling-up of the technology in the four centuries since has brought about gains of more than a million times the eye’s collecting area. The Hubble Space Telescope’s (HST) 2.4-meter mirror (orbiting above Earth’s obstructing atmosphere) resolves a foot-sized object at 36,000 miles. Unblinking charge-coupled devices (the electronic cameras affixed to telescopes) can maintain an exposure for hours, as photons from faint, distant objects impinge. Far from being bound by visible light, telescopes can be crafted to collect shorter wavelengths (ultraviolet, x-ray, and gamma-ray radiation), as well as longer infrared, microwave, and radio signals—all of which bear useful information. And spectrographic instruments attached to those telescopes can discriminate thousands of times as many colors as the eye alone, yielding data about the composition, condition, and movement of objects incredibly remote and deep in time. Of this doubling, says Buell T. Jannuzi ’84, “It’s not quite like cathedral-building, but those who started it won’t use it.” The simile is not as cocky as it might sound. Conversations about a giant telescope began in 2000—and the current goal is to begin partial operation in 2019, according to Wendy Freedman, who chairs the GMT board of directors. (Board members include the CfA’s Charles Alcock, Clowes professor of science Robert Kirshner, and Smithsonian astrophysicist and lecturer on astronomy Jeffrey McClintock.) 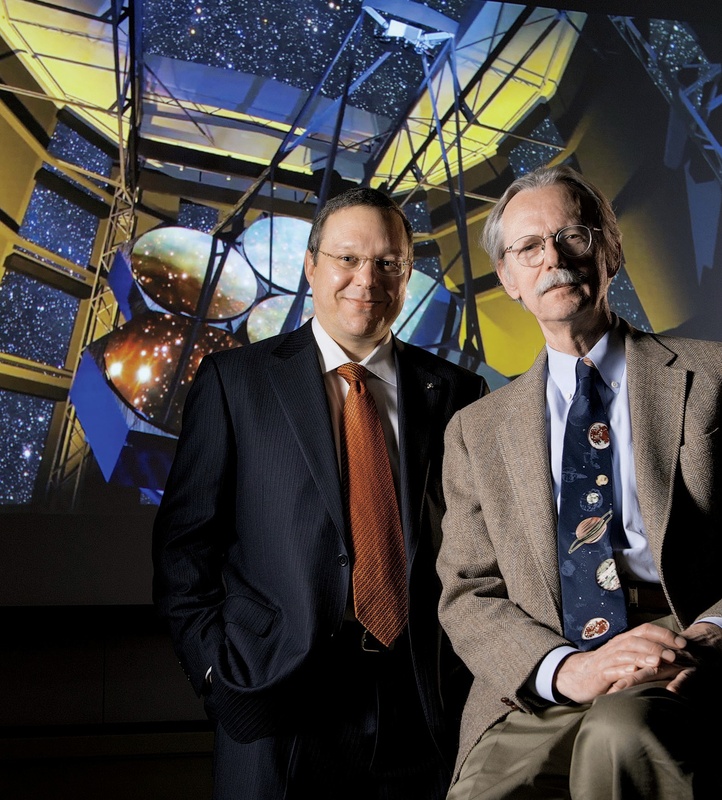 Engineering and scientific resources—and several hundred million dollars—are coming from the 10 members, so far, of GMT’s international consortium: Astronomy Australia, the Australian National University, the Carnegie Institution for Science/Carnegie Observatories, Harvard, the Korea Astronomy and Space Science Institute, the Smithsonian Institution’s Astrophysical Observatory (Harvard’s CfA partner), the University of Texas, Texas A&M, the University of Arizona, and the University of Chicago. The finished project indeed will be cathedral-sized: the mirror assembly and its enclosure will be 22 stories tall—the height of Notre Dame’s towers—comprising 1,163 tons of steel and glass and electronics, all moving without perceptible vibration on an oil bearing as the apparatus follows astronomers’ targets across the Chilean night sky. 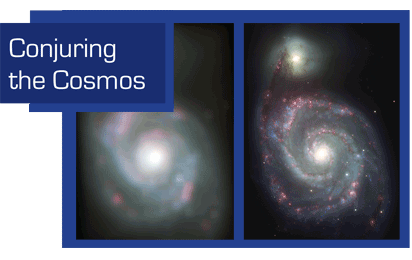 Like galaxies studded across a dark universe, there are clusters of astronomical expertise. Cambridge is one: the CfA’s constituents employ some 900 people, including about 350 Ph.D.s in astronomy and astrophysics (not to mention MIT’s substantial cohort). Pasadena is another, with the Carnegie Observatories and GMT’s headquarters; NASA’s Jet Propulsion Laboratory; and Caltech (a member of a different consortium designing a giant telescope for Mauna Kea; yet another consortium is based in Europe). A third is Tucson, home to the University of Arizona. Early discussions among CfA, Carnegie, and Arizona scientists, partners in varying arrangements in telescopes in Chile and the United States, helped shape the GMT program, recalls Daniel Fabricant—a CfA astrophysicist, leading designer of optical and infrared telescopes (a chunk of the raw glass used to make large telescope mirrors sits by his window) and instruments, and member of the GMT scientific advisory board. He recently reviewed initial assessments of everything from optics to the stiffness and wind resistance of the prospective telescope enclosure (the site “is a mountaintop, after all,” he notes). “Everything looked good,” he says—but then again, “Every large optical device comes with a story—usually a sad one” of delays, escalating costs, and struggles to achieve the designed performance. A decade after the GMT analyses, he says, “Everything has a start. It’s the finish that’s hard.” As a result, it’s the rare astronomer who is privileged to work on two generations of leading telescopes, as he has been. 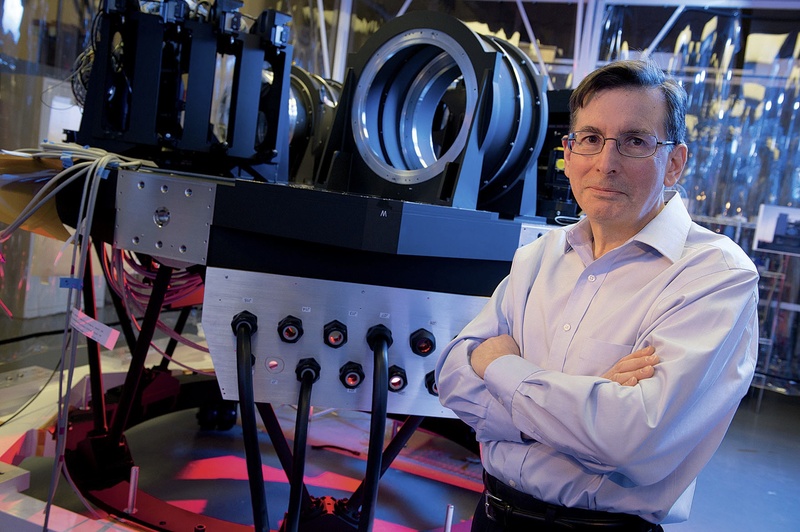 Even so, an infrared spectrograph he proposed for use on the GMT won’t be one of the “first-light” instruments built for its first years of operation, and therefore is unlikely to come on line during his active career. 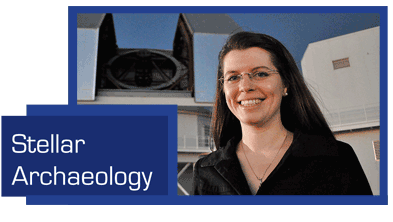 As a scientist, Jannuzi—professor of astronomy and head of the astronomy department at Arizona, and director of its Steward Observatory—may not wish to push the cathedral analogy too far, but creating the GMT has involved three engineering acts of faith. 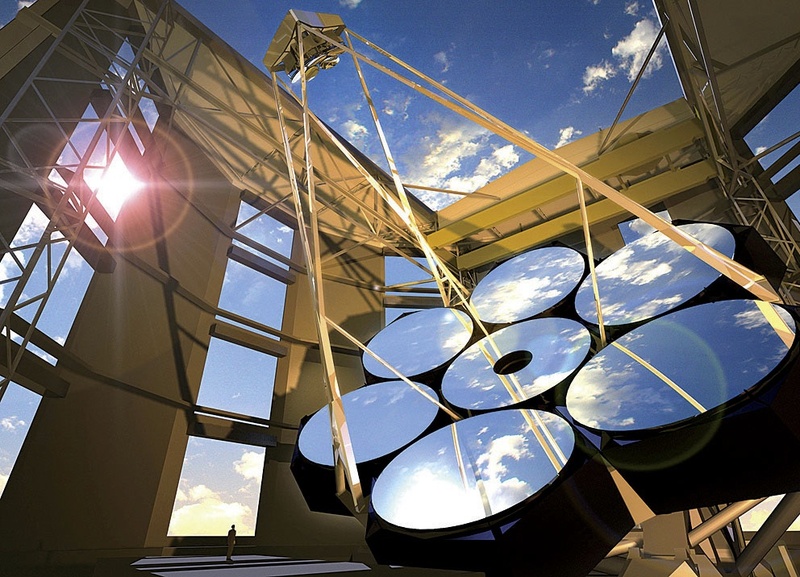 First, the telescope requires huge mirrors posing unprecedented technical challenges. Second, to operate most effectively, it must be equipped with a system to offset minute atmospheric disturbances of the telescope’s imaging—at thousandth-of-a-second intervals. And finally, the seven separate mirrors, each weighing 18 tons and shaped to minute tolerances, each nestled in a 31-ton steel cell, subject to the telescope’s motion and fluctuating temperatures and changing mountaintop winds, must be kept precisely aligned with one another. The first and second of those problems fell to the experts in Tucson. • The mirrors. “We have only two sizes,” says J. Roger P. Angel, scientific director of the Steward Observatory Mirror Lab (SOML), “big and medium.” During a tour of the lab, nestled under the steeply raked east side of Arizona Stadium (“Home of the Wildcats”), Angel, Regents Professor of astronomy and optical sciences at Arizona, notes with amusement, “The world demand is one large mirror per year.” “Medium” mirrors include the 6.5-meter (21 feet) units fabricated in 1994 and 1998 for the twin Magellan telescopes operated by the Carnegie Observatories in Chile (with partners Harvard, MIT, and the Universities of Michigan and Arizona)—precursors to the GMT. The “large” diameter (8.4 meters; 27.5 feet) was realized in the 1997 and 2000 castings for the Large Binocular Telescope at Arizona’s Mount Graham observatory. 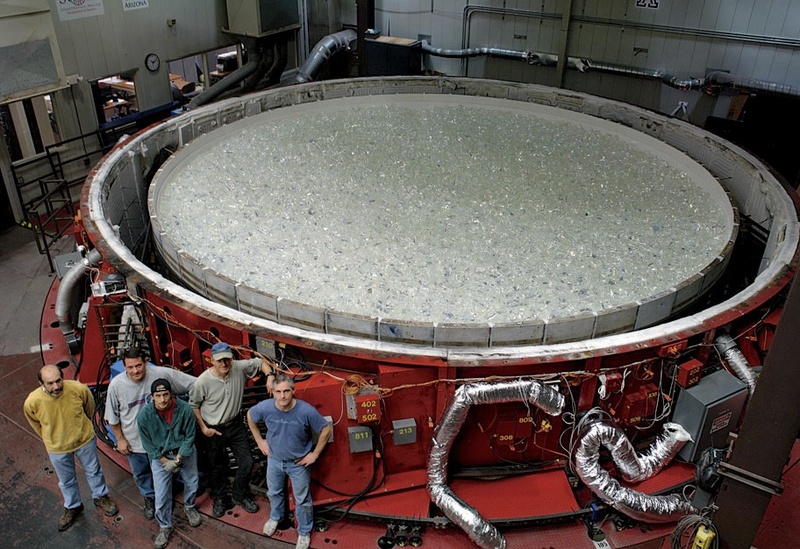 Making workable telescope mirrors on this scale has involved successive innovations: developing low-expansion borosilicate glass that is stable chemically, mechanically, and thermally; learning how to cast it, at 2,120 degrees Fahrenheit, in a rotating oven so the molten glass forms a curved shape, reducing the subsequent grinding and polishing time from decades to years; and molding the glass over and in between precisely contoured hexagonal columns of refractory material—to shape the curve of the reflecting surface and give the mirror the strength of bees’ classic honeycomb but at a finished weight a fraction of a solid-glass casting. After the cooled glass is removed from the kiln, the alumina-silica refractory material is washed out of the underside of the mirror blank with water jets. 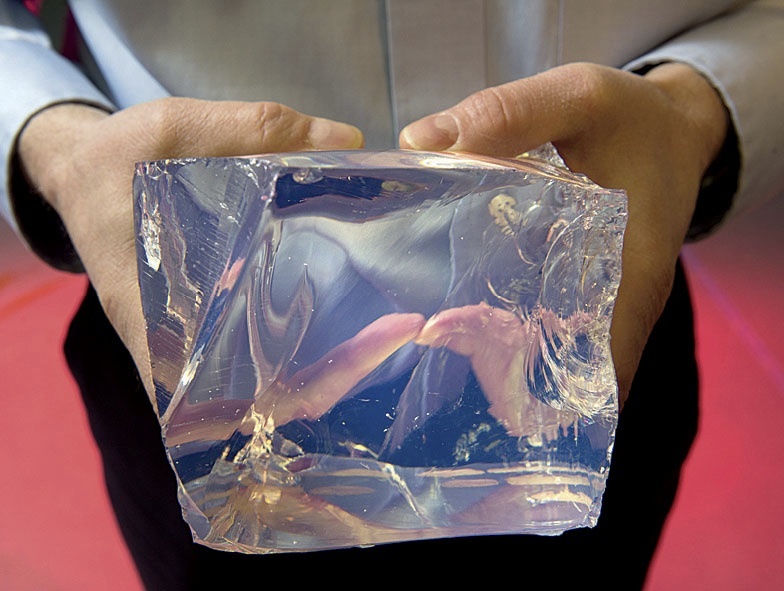 The resulting voids make it possible to bring the mirrors down to the temperature of the surrounding air within minutes (versus impossible cooling times for a solid-glass mass), readying a telescope quickly for nightly observing without thermal distortions in the glass. Based on the precedent of the 8.4-meter mirrors for the Mount Graham binocular instrument, the GMT telescope arrays six such primary mirrors around a central seventh one. The assembled apparatus will have an effective diameter of 24.5 meters (80 feet); subtracting the gaps between the mirrors and the open aperture at the focus in the center, its collecting area of 368 square meters is 20 million times that of the human eye. Astrophysicists sometimes pursue highly abstract research, but they have a very tangible feel for their instruments—and a sense of humor. Reversing the usual order of observing space from Earth, use Google’s mapping tool to zoom in on the satellite view of Carnegie Observatories’ offices: 813 Santa Barbara Street, Pasadena. Rather than some multiplayer dodge-ball court, those circles painted on the parking lot are a full-size schematic of the GMT’s primary mirrors. Making the separate segments operate as a unitary reflecting surface requires that the six outer mirrors be shaped asymmetrically, so that within the GMT, all of the collectors are focusing the photons they gather on a common point. Each of those outer, off-axis mirrors, Roger Angel says, has to be cast, ground, and polished to a more aspherical shape than any other telescope mirror in the world. Several participants describe the final form as resembling a potato chip, with a 14-millimeter variation from a symmetrical shape—equivalent to about 28,000 waves of green light. But across that irregular form, each identical outer mirror is expected to achieve a tolerance within one-twentieth of a wavelength of green light—about 20 nanometers (billionths of a meter). If scaled to the continental United States, the mirror glass would feature half-inch Rocky Mountains. Achieving that shape and precision required perfecting a computer-driven, dynamic polishing tool that could adjust the polishing shape along the plane of the mirror blank. To be sure of their handiwork, the lab technicians subject the mirrors to four optical tests; for one, the equipment required a modified 400-ton testing tower, mounted on airbags to dampen external vibration, that was pushed through the SOML roof to the top of the football stadium. (Engineers are haunted by the initial failure of the Hubble; its mirror malformation was discovered only after its 1990 launch, and Space Shuttle astronauts had to install corrective optics in 1993.) 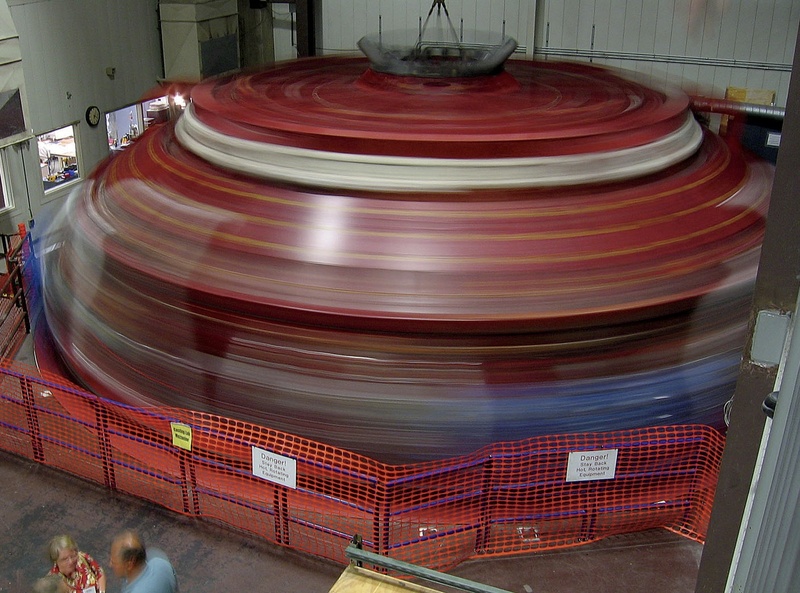 From casting in 2005 to final testing, making the first GMT mirror took seven years. The second mirror was cast early last year; the third is scheduled for this August—when the Tucson summer can perhaps supply the first 100 degrees of heating; and GMT has contracted for the glass for the fourth blank. The result, Angel says with satisfaction of his honeycomb mirrors—now that “large” orders are nearing what passes for mass production—is “the limit of how efficiently you can make a light-weight, stiff structure.” If aliens are ever discovered inhabiting some of those newfound exoplanets, he half-jokes, their observations of Earthlings should depend on telescopes of similar design. • Overcoming the atmosphere. In astronomers’ ideal world, they would live without an atmosphere. It shields out (destructive but) interesting x-ray and ultraviolet radiation, and contains water vapor, making it opaque to much of the infrared spectrum. Turbulence, and differential refraction in cool and warm air, distort incoming wavefronts. Philip Hinz, an associate professor at Arizona—an institution with deep expertise in designing solutions to this problem—calls the resulting light received at an Earth telescope “corrugated and wavy.” Think shimmering mirages on a hot day, or the romance—maddening for scientists—of a twinkling star. One workaround is a satellite. But orbiting observatories are finicky and expensive (the James Webb Space Telescope, an infrared successor to the HST, is now expected to launch in 2018, years behind schedule, and to cost $8 billion or more—multiples of its initial estimate, and enough to choke off most other U.S. missions’ funding). And they are hard or impossible to service and to fit with new instruments or controls (the Webb will orbit nearly a million miles from Earth). Nonetheless, there are still atmospheric interferences aplenty above the site, so the GMT will encompass other technologies in a corrective system called adaptive optics. The seven primary mirrors, huge, heavy, and stiff, reflect the light they capture to seven matched secondary mirrors mounted above, within the telescope structure. There, the similarities end. The secondary mirrors, each 1.1 meters in diameter, will be extremely thin—disks of fragile but flexible two-millimeter glass—so they can be readily deformed. Philip Hinz explains that each mirror will be mounted on 672 tiny magnet-like actuators (the shape of button batteries comes to mind) capable of firing 1,000 times per second. As wavefront detectors analyze arriving light, the actuators are programmed to deform the secondary mirrors into what he calls a “quilted wavefront pattern the opposite of the incoming wavefront”—neatly offsetting atmospheric distortion and making GMT infrared resolution 10 times sharper than the HST’s imaging. Where astronomers are observing near a naturally bright guide star, the adaptive-optics system can use that light to calibrate the character of the wavefront. But for other kinds of viewing, or where there is no such reliable beacon, the GMT will, in effect, make its own stars. 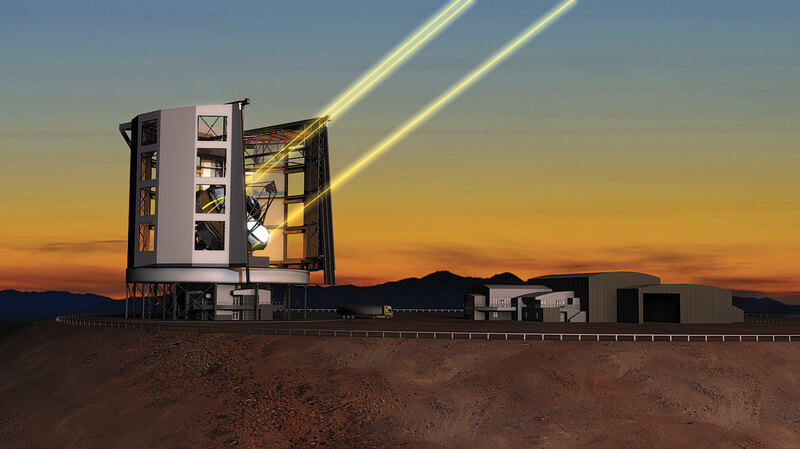 A series of six lasers, grouped in pairs around the periphery of the primary mirrors, can be beamed skyward; they are tuned to excite sodium atoms high in the atmosphere—creating tiny stars of known wavelength, whose light, captured by the telescope and wavefront detectors, will enable the needed adaptive corrections. Assessing the achievements of the scientists and engineers who perfected these technologies, Peter A. Strittmatter, Regents Professor of astronomy and Jannuzi’s long-term predecessor as director of the Steward Observatory (experience that has made him a hands-on historian of telescope technology during the past four decades), says, “The borosilicate brigade and adaptive [optics] are revolutionary for astronomy.” Comparing the GMT’s design to imaging assembled from multiple, interlinked observing instruments, he continues, “God doesn’t let you get to the sharpness unless you have it all in one system.” Of the GMT, he says, “The whole range of astronomy will be given a huge boost”—assuming one more critical issue is solved. • The phasing problem. A final GMT challenge is keeping its huge mirrors properly aligned with each other. For all the precision of each primary glass element, the relatively large gaps between adjacent mirrors pose a challenge for proper focusing. Circumferential edge sensors indicate the mirrors’ location relative to their neighbors. 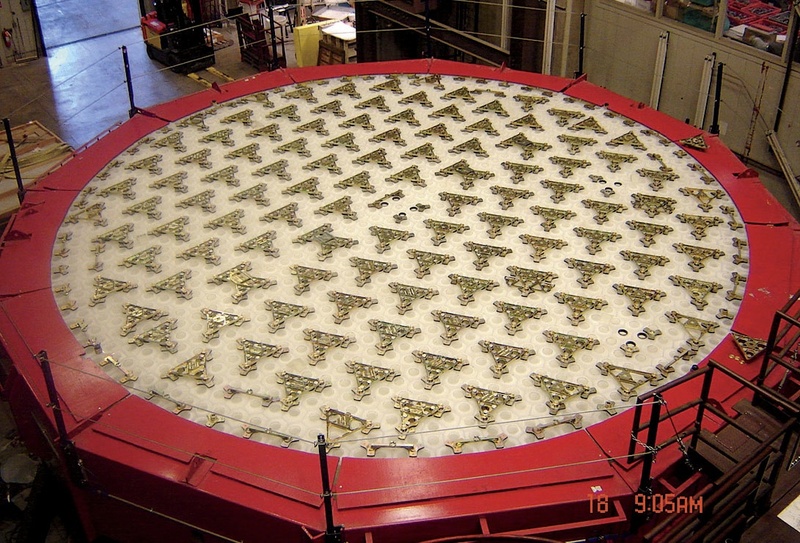 Each primary mirror is mounted on 165 load-spreading supports, with actuators to maintain proper shape and stiffness (“active optics”) as the temperature changes and the telescope assembly moves. They and especially the secondary mirrors’ high-speed actuators can be employed to establish and correct alignment, within a millionth of an inch. Exquisite precision is required. Wavelengths of light arriving from space will hit the GMT’s mirrors—and ultimately, the charge-coupled device or instruments (such as spectrographs)—at slightly different times. Getting the light thus collected in phase, with coherent patterns and a sharp focus, depends on repeated measurements and mirror adjustments to a fraction of a wavelength, before and during observing runs, according to Brian McLeod of the Smithsonian Astophysical Observatory. An instrument designer who helped build a 360-megapixel camera for the Magellan telescopes, McLeod worked with the Carnegie Observatories’ Stephen Shectman to design a phasing camera for the GMT, using Milky Way stars as a reference. Scientists from throughout the GMT organization hailed a recent, successful test of the camera, on one of the Magellan telescopes, for overcoming the last-frontier technical challenge to the next-generation machine. McLeod describes this and other projects as working with teams of engineers to keep complicated assignments on track, so that detailed designs meet the requirements for astronomical instruments. In other words, keeping the engineers themselves properly phased. Writ large, the GMT program itself is in a similar state of precise phasing. At the organization’s headquarters, on the third floor of a nondescript Pasadena office building, Patrick McCarthy and a few dozen colleagues are now in the thick of “big science” project management. Their network extends to McLeod and many others in Cambridge, responsible for the active optics and design of a “first light” spectrograph essential to the telescope’s initial science mission (see “Exploring Exoplanets,” page 36); to the mirror lab in Tucson and adaptive-optics experts there and in Australia; to teams in Texas and Korea—and beyond. The process comes together in formal project meetings and project-design-review spreadsheets of a size and complexity (with hundreds of individual tasks and dozens of columns of deadlines and critical check points) that perhaps only astrophysicists could truly enjoy. If that schedule holds, Freedman says, the GMT could begin operating in 2019, with the first four mirrors in place and an initial astronomical instrument or two. The remaining mirrors would arrive, by ship and truck, at annual intervals thereafter, enabling the full research program by 2022. John S. Rosenberg, editor of Harvard Magazine, in 2004 visited the Chilean observatory where the GMT will be sited.